Monrovia, Liberia - : Liberian President, H.E. Dr. George Manneh Weah, says the ongoing infrastructure projects being undertaken by his Government will give Liberia a deserving facelift. He said the projects represent a practical realization of his dream to transform the country. President Weah said he was elected to work for the good of the country and its people and that he would remain restless until the impact of his government’s initiatives are felt by every Liberian. “Seeing the Ministerial Complex nearing completion is a complete joy owing to the rancor that marred the demolition of the Ministry of Defense Complex which was situated in the area it is being built”. The President lamented. “Indeed, this is good for the country,” he stressed, adding that he was under obligation to ensure the completion of the projects that were started by his predecessor, as government is continuity. “When you entrust a leader with a country, you have to believe in that leader,” the President said, emphasizing that he is a man who does what he says and must be believed by the people. The head of state disclosed that the government of the People’s Republic of China is planning to construct the largest diagnostic center at the Military Hospital. “This is good news certainly for the oldest Republic in Africa to have the largest Laboratory or Diagnostic Center in Africa,” the President stressed. “Though some people say the terminal is small, but I can say it is good for the country. 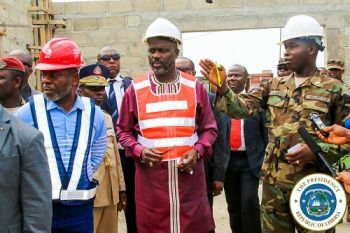 We manage the small one, the big one will come,” President Weah said, speaking inside the terminal which is expected to be dedicated in March of this year.